Light the barbecue. While it is heating up, toast the coriander seeds for 2 minutes in a medium-hot frying pan and grind into a powder using a spice grinder or pestle and mortar. Pass the seeds through a sieve and discard the husks. In a large bowl, mix together the powdered coriander seeds, beefmince, pork mince, ground cloves, ground nutmeg, salt, pepper and breadcrumbs until all the ingredients are thoroughly incorporated. Divide the mixture into 6 balls approximately 200g in weight.Between the palms of your hands, gently flatten each ball intoa burger with roughly the same diameter as the bap andapproximately 2cm thick. 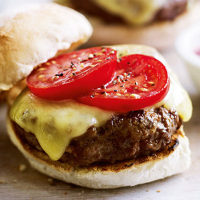 If you don’t have time for a barbecue, you could grill or pan-fry the burgers instead. Waitrose Foundation Cederberg Shiraz 2008, South Africa. There’s no better match for a well-seasoned burger than a smooth Shiraz with hints of black pepper and blackberries. Meat: We advise you check that the burger is cooked all the way through, with no pink meat and making sure the juices run clear.